The Ministry of Foreign Affairs yesterday launched a commemorative stamp to mark the 50th anniversary of bilateral relations between Guyana and Brazil. According to the Ministry, the design and production of the stamp is a joint project undertaken with the Guyana Post Office Corporation. At a ceremony in the Ministry’s conference room, the First Day Covers and stamps were launched in the presence of Minister of Foreign Affairs Carl Greenidge, Minister of Public Telecommunica-tions Cathy Hughes, Deputy Head of Mission of the Embassy of Brazil Paulo Silos, and other members of the diplomatic community. Chairperson of the proceedings Ambassador Ronald Austin said the launching of the stamp was one of several events to recognise the importance of this anniversary. Other activities which have been held include a seminar on Guyana-Brazil relations, a football match held in Rio de Janeiro, a safari in the South Rupununi and a series of Portuguese classes at the Brazil Cultural Centre. Still to be launched are a supplement in the Guyana Chronicle and a booklet detailing the various areas of diplomatic co-operation the two countries have embraced since the formalisation of relations on August 26th, 1968. Greenidge said that Brazil has been a friendly and cooperative neighbour and a valued partner to Guyana. “In recent years, our bilateral relations have intensified through high level encounters followed by implementation of co-operative projects,” the Minister said. He recalled that following a trip to Brasilia last year, he and Minister of Public Infrastructure David Patterson signed an updated air services agreement and a complementary agreement for technical cooperation in seed certification, pest risk analysis and modernisation of plant health services in Guyana. 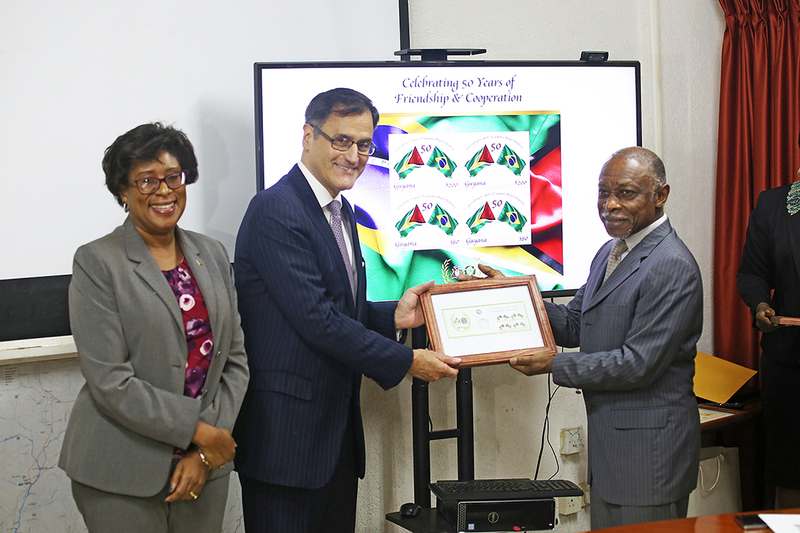 Additionally, following a December 2017 visit by President David Granger, another complementary agreement created the Brazil-Guyana joint commission for infrastructure development and facilitated the implementation of a project to introduce technology to reduce drought in Region Nine. Silos also acknowledged the cooperative relationship between the two countries and revealed that a Brazilian version of the stamp will be launched on October 26th. “We should not be fooled by its small size…it has its own special impact because it is not restricted spatially,” he said, while adding that its impact on possibly thousands will serve as an enduring testimony of the relations between the two countries. The Minister recalled the story of the British Guiana 1c magenta, regarded by many philatelists as the world’s most famous rare stamp. She said that the rush job, which was commissioned after an anticipated delivery of stamps by ship did not arrive in 1856, was lost until it was reportedly discovered by a Scottish schoolboy in Brazil. Today that stamp is worth US$9,480,000.